Learn keyboard shortcuts for converting text to numbers, ignoring errors, pasting values, and more. Full article and tutorial video. This post will explain keyboard shortcuts to access the Error Checking, Paste Options, and Quick Analysis menus using the Menu Key on the keyboard. You will learn keyboard shortcuts for converting text to numbers, ignoring errors, pasting values, and more..
Do you ever use the Menu Key? It is typically located on the right side of the keyboard between the Alt and Ctrl keys. It's also referred to as the Context Key, Application Key, or Right-click Key. 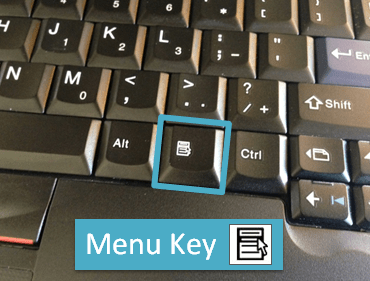 The Menu Key can be used in combination with the Alt key for some useful keyboard shortcuts in Excel. If your keyboard does NOT have a Menu Key, Shift+F10 will work as an alternative. I have an article on the best keyboards for Excel that lists keyboards and laptops that still have a dedicated menu key. There are three different warning/option boxes that will pop-up next to a selected cell. 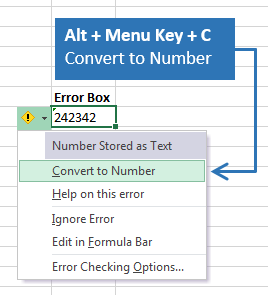 Error Box – This box is displayed when a possible error is detected in a cell by Excel. You will see a small green triangle in the top left corner of the cell. Paste Options – This box appears after cell(s) have been pasted in the worksheet, and displays various paste special options (paste values, formatting, formulas, etc.). Quick Analysis Box – This feature is new in Excel 2013 and allows you to quickly apply some analysis on the selected range of cells (conditional formatting, charts, totals, etc.). When any of the pop-up warning boxes appear, you can press the Alt+Menu Key to open the pop-up window and view the options. The keyboard shortcut to Ignore Errors is Alt+Menu Key+I. That is a quick way to remove the in-cell error warnings (small green triangles at top-left corner) in the selected range of cells. The Paste Options menu will appear to the right of a range after a paste is performed. If you are using Excel 2007 then you can access the Paste Options menu using the Alt+Menu Key shortcut. The options can be selected by pressing the underlined letter in the option name. 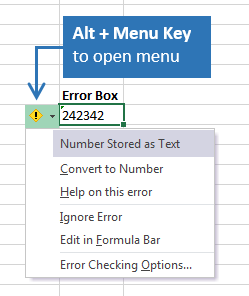 Starting in Excel 2010 this menu can be accessed with the Ctrl key. When the menu appears with all the paste options, you can press the letter in parenthesis next to the option name to select the command. So Ctrl then V is the shortcut to Paste Values after you have pasted the cells. That means you can press Ctrl+V twice to paste values (once to paste, then the second time will paste values). The caveat to this is that you have to press and release the Ctrl key the second time, then press V.
So the full keyboard shortcut to paste values is Ctrl+V, Ctrl, V.
The shortcut to paste formulas is Ctrl+V, Ctrl, F.
I prefer to use Paste Buddy for my most common paste commands (values, formatting, formulas). Paste Buddy is an Excel add-in that allows you to create custom keyboard shortcut for any of the paste special commands. The Quick Analysis menu has a dedicated keyboard shortcut, Ctrl+Q. You can also use the Alt+Menu Key shortcut to access the menu. Once the menu is open you can use the keyboard arrows and tab key to move through the menus and select the options. Then press Enter or Space Bar to make your selection. I don't believe you can use any letters on the keyboard to select the options in the Quick Analysis box. When you press the Menu Key (without Alt), the right click menu appears and you can press any of the underlined letters in the menu to perform the action. Here are some of the most useful shortcuts. The Menu Key can be used for a variety of useful keyboard shortcuts in Excel. It is a fast way to access the error checking box for converting to numbers or ignoring errors. If you are using Excel 2010 or later then you may not need it for the paste options shortcuts, but it is nice to know that any pop-up box can quickly be accessed with the Alt+Menu Key combination. Checkout my article on the best keyboards for Excel to learn more about other features to look for in a keyboard. Please leave a comment with any questions, and let us know if there are other shortcuts that you find useful. How do I change which key to highlight? Like the D in Delete, change it for another one for example. one of my asset is win 7 & working on msoffice 2013 , in excel shift+right arrow or shift+left arrow is not working for selecting cells in one user login but it is working in another user cell in same system . the same is working in word . After looking over a few of the blog posts on your web page, I truly appreciate your way of blogging. I added it to my bookmark webpage list and will be checking back in the near future. Please check out my web site too and let me know your opinion. Keyboard short cuts are awesome and speed things up. The ones you have shared with us take a little time to memorize but what a difference when you use them on a regular basis. I want to shortcut key regarding pivot table convert in normal form and we have not to change in format. Hi Leo, Great question! I’m not exactly sure what causes the order that those menus appear in. Sometimes the error menu comes up, other times the quick analysis appears. If the quick analysis appears first, you can press Alt+Menu again to see the error checking box. This means you have to press the keyboard shortcut twice. Another option is to turn the quick analysis off if you don’t use it. You can do this from the Excel Options menu on the General tab. Here is a screenshot. I hope that helps. Let me know if you find any other solutions. Thanks! 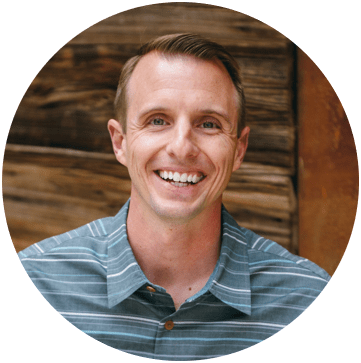 You might want to checkout my free video series on the lookup formulas, including VLOOKUP. This training series will help you get started with VLOOKUP. I’m currently running Excel 2007. I am having problems with my short cut menu operation. On most occasions I need to right click several times before the short cut menu will stay up. It appears every time I right click, but disappears immediately, before eventually staying on the screen. I have been unable to resolve it. Any idea please? I have not heard of that one before. Is it happening in other applications besides Excel? If so, it is probably a Windows issue. If it is only Excel, do you have any other add-ins or macro enabled workbooks open? Those could potentially be causing the issue. You can also double tap ‘Ctrl’ to bring up the menu options. The one thing I can’t figure out is how to cycle between menus in the rare instances when both the error and quick analysis boxes pop up. Thanks Bob! Just out of curiosity, do you use the Quick Analysis often? If so, what are your favorite features? Nice post, Jon! I linked over to this one from a newer one, and found it to be very informative. As Bob mentioned, the arrow keys may be used, but initially this is only to cycle through the different tabs on the menu. Additionally, once you have selected the tab that has the option you want to use, you can click the Tab key to get down to the options and use the arrow keys once again to cycle through the options on that tab. On the Totals tab, where not all of the options are displayed, the arrow keys will continue to scroll forward/back to/from those options as well. You can also click the Tab key again to get back up to cycling through the tabs, meaning the Tab key toggles between the tabs and the options.